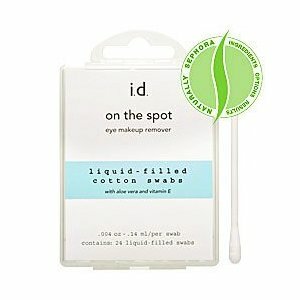 Bare Escentuals On The Spot is a cool eye makeup removal. It is 24 soft cotton swabs filled with a solution that conditions skin as well as removing eye makeup. This formula is alcohol free and contains aloe Vera, so it shouldn't dry out skin. Simple snap the swab at the colored ring to release the liquid into the tip. In a sweeping motion gently remove any unwanted makeup. I have compiled the lists below from the opinions of the ladies using the swabs. Water (Aqua), Cocamidopropyl Betaine, Aloe Barbadensis (Aloe Vera) Leaf Juice, Phenoxyethanol, Methylparaben, Propylparaben, Tocopheryl Acetate (Vitamin E Acetate), Yellow 5 (CI 19140), Citric Acid. I love Bare Escentuals products and I think this is a brill invention, especially for traveling! If you would like to buy Bare Escentuals On The Spot it costs $5. Which I don't think is a bad price unless you are going to use them every day, then they would end up being expensive.